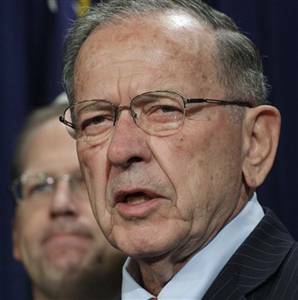 I noted a while back that Ted Stevens’ photo on his website is a little…outdated. I’m guessing by 15 or 20 years. It’s not a crime, but it is (or should be) a little embarrassing. Age denial may be good for 3 or 4 years, but after a while, you just gotta deal with it. Now, the phenomenon of age reversal has taken an interesting twist. 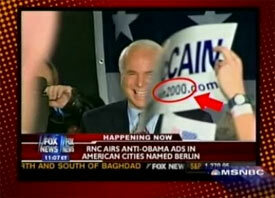 While reporting on the McCain campaign, Fox News used a clip which features John McCain looking downright perky! “Wow”, I thought. “He’s holding up pretty well”. Turns out that Fox dug up 8-year old campaign footage from McCain’s 2000 presidential bid. This takes a giant leap past one man’s vanity, and lands squarely in a very scary place. We know Fox is nothing more than a mouthpiece for the current White House, and that ‘fair and balanced’ is Orwellian double-speak for ‘promoting the conservative agenda’. We’ve also seen Fox many many times “accidentally” put a D instead of an R next to names like Larry Craig. So this cheesy attempt to portray a really old candidate as less really old shouldn’t be surprising. Good for MSNBC for figuring this one out. Bedtime Thread – One Word Only. Palin Stomps Out of Room and Slams Door. Won’t Empty Pockets. Palin is Back at Work. Come to the Muckraker’s Ball! Bedtime in Alaska – Night Kitchen is Open! Sarah Palin – All. Year. Long. Walt Monegan for Governor?! Can I Vote Now? Sarah Palin Shoot ’em Up Game! What Do Economists Do All Day?